Difficulty: Easy Easy with some modest slopes. Footing is uneven in some places. The surface is natural, some crushed stone sections and pavement/asphalt connections. Entrance Location(s) & Parking Info: Parking is available at the Skate Park at the Fields of Uxbridge. The O’Neil Trail begins with a journey around the treed edge of the recreation area, then heads into a scenic wooded area that leads to an idyllic view of Uxbridge Brook. The trail exits the woods near Ball Road, where it follows the edge of the soccer fields back to the head of trails sign. 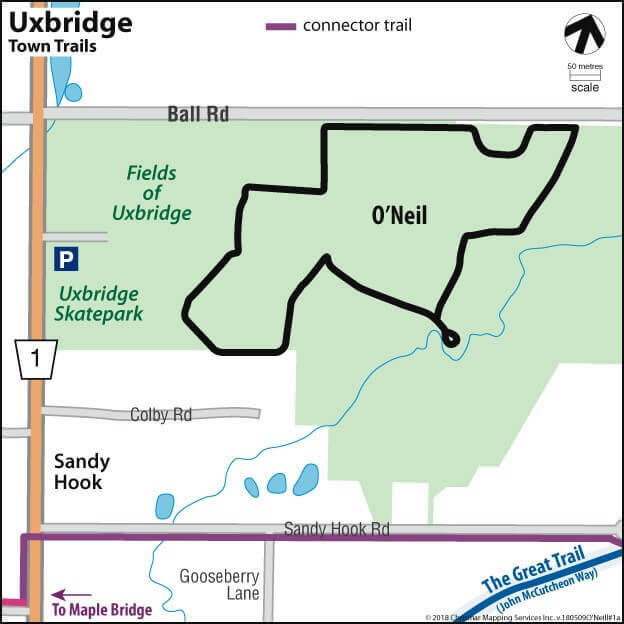 The trail is named after Uxbridge resident Michael O’Neil, local farmer and blacksmith, who owned the property in the area.